Thermos Stack N' Lock Insulated Food Storage System Starting At $6.49! Ships FREE! You are here: Home / Great Deals / Thermos Stack N’ Lock Insulated Food Storage System Starting At $6.49! Ships FREE! Thermos Stack N’ Lock Insulated Food Storage System Starting At $6.49! Ships FREE! Packaging food efficiently and safely is a hard thing to do. It usually involves using different sized containers tape and awkwardly arranging it in a bag. 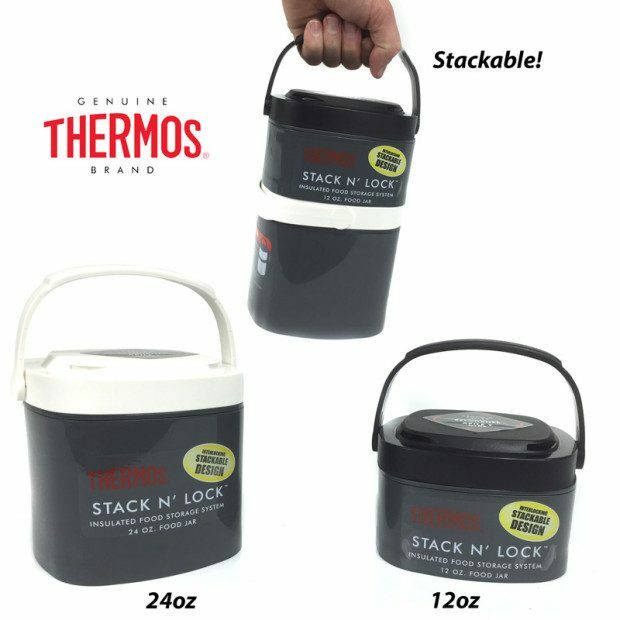 The simple solution to your food storage and transportation issues is the Thermos Stack N’ Lock. Order the Thermos Stack N’ Lock Insulated Food Storage System starting at $6.49! Ships FREE! Quantity discounts available! These handy containers not only provides quality insulation, but the lids of the containers are designed with the stack and lock system. This allows you to attach and detach multiple containers, saving both time and space. – BPA-Free plastic container, foam insulation – Containers Stack and lock together – Container is microwave safe (lid is not). 12 and 24 ounce sizes available.